This is the time of year when landscapers aerate and power rake clients’ lawns. Those litttle plugs that the aerator leaves behind can leave lawns looking a little unsightly for a few weeks, but the health of the lawn is improved by allowing more air, water and nutrients to penetrate the grass roots. What about the other unsightly lawn damage that we are seeing in Vancouver at this time of year? Lawns that look like they have been torn up by some heavy-duty machinery then left for dead most likely have an infestation of Chafer Beetle. 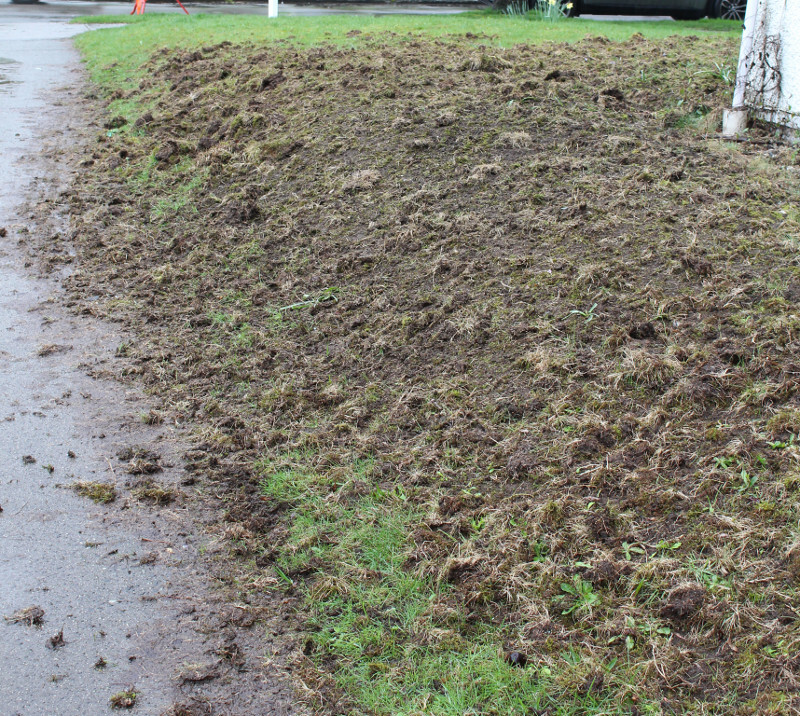 Here’s a photo of Chafer damage on a Kitsilano lawn this week. While many homeowners think that crows and racoons are responsible for the damage, they are really just foraging an already damaged lawn for a free meal of juicy chafer beetle grubs. I have seen quite a few of these grubs in the soil and in lawns in gardens around Kitsilano this winter and at the monent they are big and fat! Great for hungry crows and other critters. So what is the Chafer Beetle doing to lawns? Females lay eggs in lawns in June and July. As the grubs hatch from the eggs in the following weeks, they start to feed on grass roots, feeding right through the winter until the following spring. Their feeding leaves grass lying loose, without its roots to anchor it to the soil. Crows, racoons and skunk easily rip up the rootless grass to get at the grubs. This cycle continues until the grubs pupate and emerge as adults in the summer, and the cycle begins again. What can be done about Chafer Beetle damage? As with many pest infestations that affect our garden plants and soil, there is no quick-fix solution for Chafer Beetle damage. In previous years, I have seen many lawns with netting over the lawn, or CD’s stuck in the lawn. While these can work in scaring away birds and racoons, they don’t deal with the actual problem which is the grubs eating the roots. In fact, by preventing the birds and raccons from eating the grubs we are stopping them from providing a free pest control service. The only control that is allowed in Vancouver, which has a ban on the use of cosmetic pesticides, is the use of nematodes. When added to the lawn during a brief window of time in July these parasites burrow into the body of the chafer beetle grub and kill them. Here’s a video of my collegaue, Maria Keating at City Farmer, explaining how to apply the nematodes. Nematodes are available in garden stores in early July. Often you will need to add your name to a list as supplies can be limited. If you would like us at Growing in the Garden to apply nematodes to your lawn, please contact us.